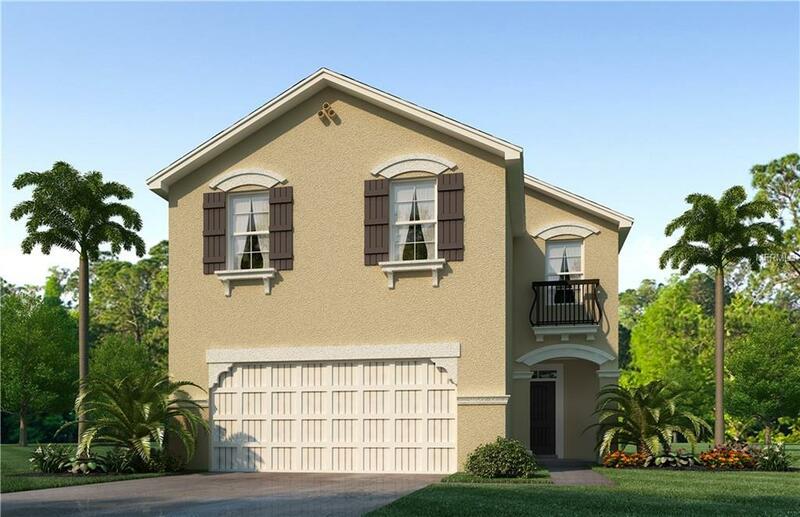 The "Aisle" model is a two-story Spanish cottage style home with 4 bedrooms, 2.5 baths, 2-Car garage with 2,007 SF of air conditioned living space. Modern open concept design feels spacious and welcoming. Awesome great room has a kitchen with large center island perfect for serving, counter top dining and entertaining. Abundant storage with lots of cabinets, pantry, coat closet and under-stair storage. All new appliances included: smooth-top electric range, microwave hood, dishwasher, side by side refrigerator with ice and water in door. Great room has combination Kitchen, Dining and Living Room with abundant windows and sliding glass doors across the back of house to the covered lanai to pond and preserve view. Upstairs the spacious owner's suite can accommodate a king size furniture set and has a walk-in closet. The en-suite master bath has a double vanity, walk-in shower and linen closet. The 2nd and 3rd bedrooms share a hall bath with double sink vanity. The laundry room is located upstairs near the bedrooms for convenience and includes washer and dryer. Community is in a great location just one block from Publix and within 2 miles of Super Walmart and a brand new Home Depot on SR 64. Quick access to I-75 only 2 miles away. Abundant shopping and restaurants nearby. Very good schools. Best beaches in the country! Covered Pavilion, picnic tables, barbecue grills, playground, dog park.